In my world today, the sky has soft hue colors, but nice and pleasant weather. The roses of Sharon compete with one another to show their last blooms. We have two types of roses of Sharon as you can see; one has a touch of color at the heart, and one is totally white. These gorgeous roses of Sharon planting themselves all over the backyard, and didn't take long to flower! I actually have to guard my yard from these invading plants by uprooting all the young one every time I see plant growing. Have yourself a fantastic new week! Joining Our World Tuesday and Outdoor Wednesday! Icy, I adore those flowers and the one with a touch of color is just gorgeous. As always, wonderful post and mosaic. 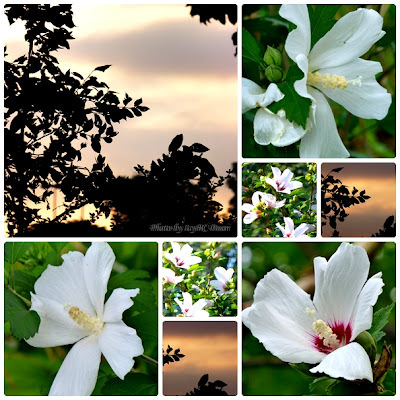 I had never seen white Rose of Sharon until I moved here to PA. And to my surprise I saw pure white ones as well as those with the claret throats. Recently I captured some photos of them. I shared them on my blog....so pretty: http://anextraordinaryday.net/joy-day-whatever-happens/. I had no idea there were so prolific, or so long lasting. They bloom for months. Thanks for sharing your lovely photos! I've long wanted to have these plants in my garden, but they easily succumb to aphids and mealy bugs and later on virus in our hot tropics. So i just content myself looking at photos in blogs, thanks to blog revolution! those are beautiful shots of rose of sharon, Icy, and as always, love your mosaic. i love the one with the burgundy heart. Beautiful!! Boom & Gary of the Vermilon River, Canada. Love that one in the lower right corner, with the red center. Pretty sky shots, too! So glad I am not the only one pulling the little plants out! Yes, they really take over in a matter of a just one year! You can come to my yard and get some more plants, Judy! If I want to have any space left in my yard, I have to uproot them! They are so beautiful! Great pictures! You could start a Rose of Sharon shop on the side of the road and sell the seedlings! Wish I could drive by and buy one from you!